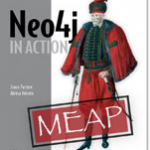 Manning has just announced that their new book, Neo4j in Action, is available via the Manning Early Access Program. This exciting new book by Jonas Partner and Aleksa Vukotic is the first full length book on Neo4j, covering an introduction to Neo4j, Application Development with Neo4j, and Neo4j in production. Jonas and Aleksa are Neo4j experts and veterans. This book is a must read for all graphistas. Graph Database News has negotiated a 38% discount for all readers. Use code 12neo38 for 38% off the print, eBook, and MEAP! Databases are easier to develop and use when the structure of your data matches the way you think and talk about them. Neo4j is a new graph database that allows you to persist data more naturally from domains such as social networking and recommendation engines, where representing data as a graph of interconnected nodes is a natural choice. Neo4j significantly outperforms relational databases when querying graph data. It supports large data sets while preserving full transactional database attributes. Neo4j in Action is a comprehensive guide to Neo4j, aimed mainly at application developers and software architects. Using the hands-on examples, you’ll learn to model graph domains naturally with Neo4j graph structures. The book explores the full power of the native Java APIs for graph data manipulation and querying. It also covers Cypher – declarative graph query languages developed specifically for Neo4j. In addition to the native API, this book provides a practical example of integration with popular Spring framework. Along the way, you’ll learn how to efficiently install, setup, and configure Neo4j databases both as standalone servers and in the embedded mode, including performance and memory tuning techniques. You’ll work with the recommended tools for maintenance and monitoring of Neo4j database instance and configure Neo4j in High Availability mode in a clustered environment. No prior experience with graph data or Neo4j required. Knowledge of a programming language like Java and some experience with databases is helpful. April, the 1st ))) Great joke! Thank you for my smile and laughter!